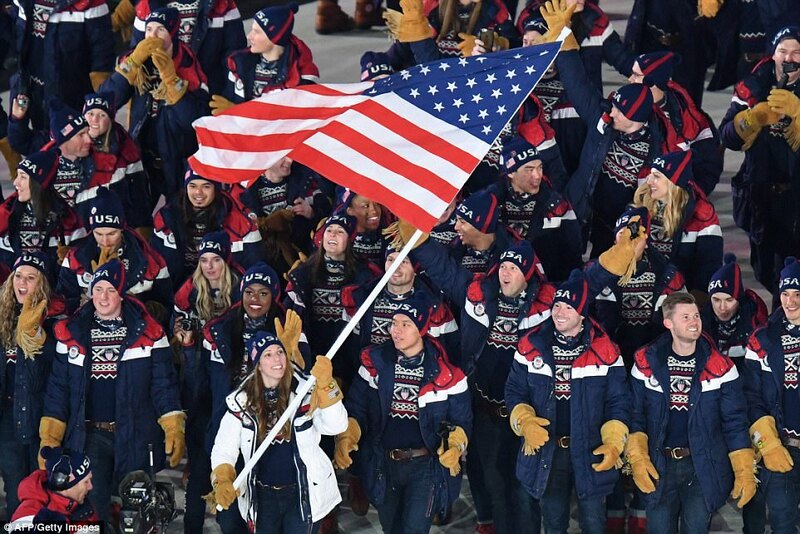 Erin Hamlin has led Team USA out for the Winter Olympics in Pyeongchang after being named as flag carrier ahead of Shani Davis, who boycotted the ceremony. Hamlin, a four-time Olympian and winner of a luge bronze medal at the 2014 Sochi games, beamed a broad smile as she led out the athletes competing at the games in South Korea to the accompaniment of ‘Gangnam Style’. The 31-year-old was chosen in a coin toss with speedskater Shani Davis, one of just a few black athletes in Team USA, who says he should have been chosen to carry the Stars and Stripes. Davis, 35, a five-time Olympian who has won two gold medals and two silver medals, lost after a vote among sports federations represented at the games ended in a tie. A U.S. speed skating spokesman said Davis had not originally planned to march in the parade of nations later on Friday, but would have made an exception if he had been chosen as flag-bearer. ‘Shani won’t march in the parade. It was never part of his plans. He is fully focused on his first race and is concentrating on that,’ the spokesman said. In an angry tweet, Davis, took a shot at Hamlin, the holder of a single bronze medal. ‘I am an American and when I won the 1000m in 2010 I became the first American to 2-peat in that event,’ Davis wrote on Twitter. He then slammed Team USA for ‘dishonorably’ tossing a coin to decide who would have the honor of carrying the flag. Hamlin, the first American to medal in luge singles and a winner of 23 World Cup medal, has already announced this will be her last Olympics as she is retiring immediately after these games. In a statement she said she was ‘honored and excited’ to be named flag-bearer adding ‘this is something totally different’. The American team has 11 Asian American athletes and 10 black athletes members, a ratio that is far lower than the number of minority athletes the team sends to the Summer Games.